Last-ditch talks to stop a teachers strike in Poland that has seen thousands of schools stay closed failed Tuesday, putting upcoming exams under threat. Following 90 minutes of discussions, Deputy Prime Minister Beata Szydlo and the heads of two main teachers' unions blamed each other for the breakdown in talks. 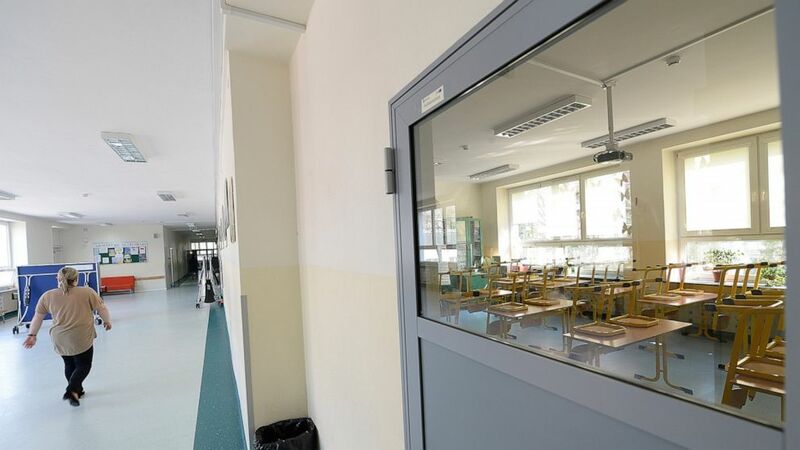 The protest is the biggest one to afflict Polish schools since a two-week strike in 1993. Szydlo argued the government had no money this year to up its previous offer, while trade unions said their new offer for spreading increases was not even considered. They said the strike would continue. Slawomir Wittkowicz of the Trade Unions' Forum blamed "ill will" on the part of the government. Szydlo insisted Wednesday's exams would go ahead and appealed to teachers to make that possible. It was not clear if that could be achieved. Protesting teachers conceded to The Associated Press that their action was dramatic, but said many among them have to juggle two or three jobs at different schools to make ends meet. None of the teachers the AP spoke to wanted to reveal their names. Slawomir Broniarz, leader of the main ZNP union, has said the union wants to "put out this fire" and called early Tuesday for a mediator to help end the standoff with the government. The government responded with an offer it had previously made but which was rejected by the ZNP and the Forum. Meanwhile, school directors were asking for help from retired teachers, religion teachers and those not on strike to press ahead with the middle school exams on Wednesday. The indefinite strike started Monday after pay negotiations with the government failed. A teacher's monthly net earnings range from 1,800 zlotys to 3,000 zlotys ($470 to $780). Teachers want an immediate 30% pay increase and to back their demand, they argued that the government recently found substantial new funds for families, pensioners and businesses, in an attempt to win support ahead of May's elections to the European Parliament. The government has offered teachers that it will accelerate a planned increase of some 15% and introduce a new remuneration system, which would substantially raise salaries but also increase the number of lessons a teacher gives a week to 24 from the current 18. Broniarz said that over 74% of more than 20,000 schools nationwide were closed Monday. According to the Education Ministry it was just over 48% of schools and education centers. Critics blame the shortage of funds for teachers on the major, costly reform of the education system that the government undertook in 2017, extending primary school education and phasing out the lower middle school, a move that many call a "deform" of the education system.